Bianca: Palm Beach has always held a certain fascination for me, my idea of ‘going to the beach’ generally involves some Carroten tanning oil and a good book. Perhaps a quick stroll down to the water’s edge and then back to my towel kingdom. In close proximity to ‘Summer Bay’ is Clareville, a small Northern Beaches suburb with virtual water views every which way you turn. A leisurely long lunch at Clareville Kiosk was perhaps the ultimate way to spend a Saturday. We were warmly greeted by owner Nathan, who with Chef Rob have a distinguished career in hospitality. The restaurant is akin to a small cottage, very elegant and understated with prominent whites and crisp linen without the stuffy service and snooty vibes. The décor is rather simple, truly letting the food have centre stage and rightly so. It’s very very good. There are a few dining options – 2 courses at $55, 3 course at $65 and 6 courses at $105. Its well worth going for 6 courses, the food truly warrants the expense. We began our leisurely lunch with a glass each of the Spring Vale ‘Salute’ sparkling, a light champagne that was very easy to drink. Something not so great when you have a long drive back to the Inner west. This was paired with an Amuse Bouche (or Moosh boosh as we now call it) consisting of a Celeriac Puree with celeriac crumbs. Which was very smooth and creamy, the perfect Kick-starter to the palate. The Sourdough made in-house with milled flour from local bakery Berkelo in Brookvale was denser than your average sourdough loaf and the flour gave it a darker appearance, almost like a rye. Most surprising of all was the whipped butter, Nathan set it down before us and said “You tell me what’s in there”. And after one mouthful it was very obvious, my former arch nemesis Vegemite. But it worked so well, almost a hint that lingered on the palate. Everyone knows just how much I love my bread and butter! Alex carried on with the drinking with the Kentia Albarino 2013 – a tropical light crisp white that was a great accompaniment to his next course. Avocado, chia seed crackers, smoked ricotta and salmon roe. Gorgeously plated, I don’t think we’ve ever seen avocado been made to look so beautiful. The avocado was soft and velvety. And the chia seeds added some nuttiness. The Quail, broad beans, black garlic and stuffing was on the heavier side but sharing between us aided to lighten the load somewhat. The quail roulade was incredibly tender with a slight gaminess. I couldn’t quite put my finger on the ingredient that tipped it over into an almost Asian tasting dish. Alex was steamrolling through the vino, getting proper sloshed – the Mitolo Jester Sangiovese Rose 2016 was on the drier side with some fruity berry notes, I’ve never really been taken with Rose’s. Preferring my full-bodied reds. I have fallen in love with leeks (said probably no-one ever) but they are such a underutilised vegetable. When charred they have a slight hint of smokiness with a sticky sweetness. They’re divine. The Leeks, mustard cream and cashew was up there with my favourite dishes on the day, the leek was tender and the fondant potatoes were perfectly cooked and creamy. I can easily see why this is considered a signature dish. The Ginger Cured Snapper, watercress and finger lime was very refreshing, light and summery. With bold citrus elements. The fennel was an understated element and this was a great example of the simple addition of olive oil drawing everything together. I moved along to the Vignamaggio il Morino – a medium body Tuscan chianti, a little ashy and thin for me, though I could see why it was paired with the bold and rich risotto. Now onto my absolute favourite dish of the day. The Mushroom Risotto, truffle cream and Onion rings was generous in size and flavour. The rice was cooked just past al dente but perfect for me, I tend to shy away from chalky risottos. The adorning onion rings tasted exactly like a packet of onion rings… you know the ones I mean. As soon as it hit the table I was instantly met with a perfumey aroma from the mushrooms and truffles. It was incredibly rich and the truffle cream just tipped it over to pure indulgence. I have no qualms saying that this was the best risotto Alex and I have ever eaten. Ordinarily Alex is not a fan of duck but that changed after his final savoury. The Wimmera Duck, Jerusalem artichoke and fondant potato. The duck was expertly cooked and remained super tender. The skin was crispy and the flesh moist and succulent. We liked that we were given three different pieces of the duck. The Manjimup truffle shavings were beyond generous. The varying textures within the dish made this a joy to eat with treasures to be found within each bite. And with that we moved on to our favourite part of any meal, dessert. Which was paired with a glass of Roustabout late harvest Viognier 2013 an easy drinking dessert wine. Stickys are my favourite and this was one I jotted down for future personal drinking! The first dessert was the Strawberries, Pea, Coconut and Buttermilk ice-cream. Before I go into detail I should say that dessert for me has to involve some chocolate for me to be interested. I loved the varying textures and temperatures and the coconut panna cotta. The toasted desiccated coconut gave a warm nuttiness to the dish. The pea puree was sweet with a hint of basil but ultimately this wouldn’t be something I would order again. I just found peas in a dessert a little too confronting. Our favourite of the pick was the Beetroot and White Chocolate Parfait, Honeycomb and smoked cream. I don’t like beetroot but I loved this dessert. There was a subtle sweetness from the white chocolate. The crunch from the honeycomb was a welcome addition. The smokiness in the cream was almost strangely ‘bacony’. I couldn’t quite work out if I liked the cream or not I just know I couldn’t stop eating it. Alex and I were blown away by the technique and quality of food. Great attention to detail was not only paid to the food but to the wine pairings as well. Our hats are off to Nathan and chef Rob, they’ve honestly brought a ‘must dining’ venue to an otherwise left of centre destination. *For Food’s Sake dined as guests of Clareville Kiosk but all opinions are our own and independent. 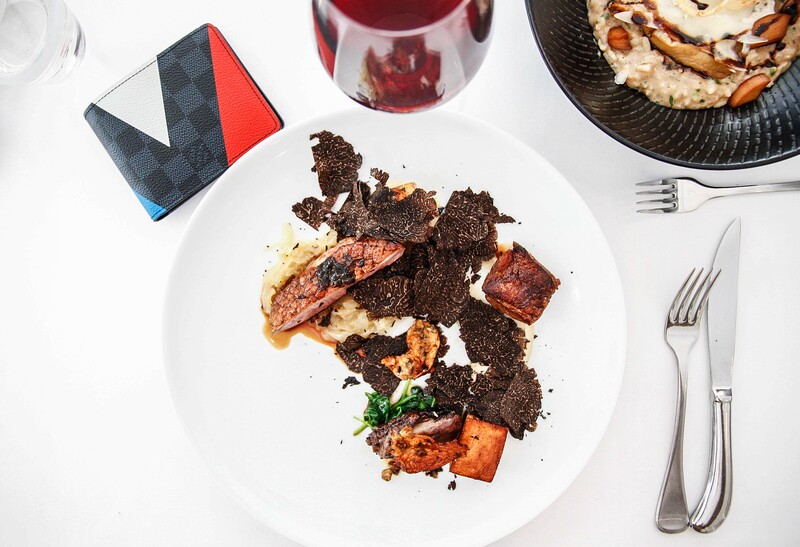 That risotto sounds absolutely perfect but woahh at all the truffles on the duck!